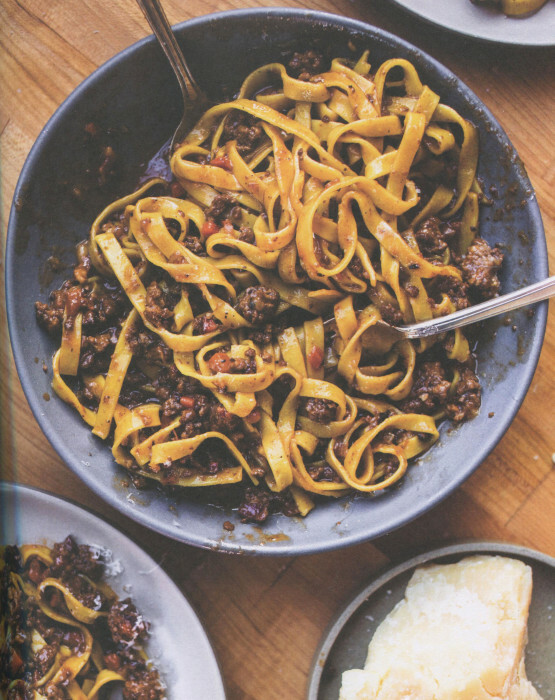 This recipe comes from Flour + Water: Pasta, the seminal pasta cookbook by San Francisco chef Thomas McNaughton. A pasta maven, Thomas spent time in Bologna, perhaps the world center for pasta making. He notes that in Bologna, you measure the quality of a pasta shop, not by its filled pastas like tortellini, but by the pure pasta like tagliatelle. You can taste the tagliatelle itself and judge it for taste and texture. In fact, in the 1970s, officials in Bologna codified the pasta and made its dimension standard: 5/16 inch wide and 1/32 inch thick. Meat sauce for pasta, technically ragu, has been made for centuries and, according to Thomas, often bastardized. Here he presents the ragu in its true Bologna form. The flavors here should meld, the sauce should be neither too wet nor too dry. The purpose of the sauce is to bind the noodles together, which is achieved because of the milk in the sauce. And there is the time factor. You may have heard that ragus need to cook for a while. Here the time is a short three hours, although you can let it linger on the stove — just add a little more milk to thin it if needed. One ingredient here is Thomas’ Rav Dough pasta from Page 7 in Flour + Water. I’m not going to duplicate that recipe here. I’m trying, not too subtly, to encourage you to buy the book and make his pasta treasure. In the directions below, there are references to page numbers in the book for fuller explanation of some of the techniques; this really is a pasta textbook. If you don’t want to make your pasta, do look for a store that sells fresh pasta sheets. This is, after all, Italian cooking and freshness is the most important ingredient. Or, yes, you can use dried tagliatelle. It will be a different dish, but still distinctive. This post is appearing on Saturday morning. You have time to shop and cook for a Sunday meal everyone will rave about. Using a pasta machine, roll out the dough to 1/16 inch thick (see page 10). With a knife, cut the dough into 12-inch strips. Make two stacks of strips, four strips per stack, thoroughly dusting between the layers with semolina flour. Allow the dough to dry for 30 to 45 minutes, or until the dough has a slightly dry, leathery texture but is still pliable. Fold each stack like a letter, forming three even layers. Cut the folded dough into 14-inch strips, shake off the excess semolina, and form into small nests on the prepared baking sheets. Set aside. For the Bolognese ragu, heat the oil in a large, heavy pot over medium-high heat. Add the onion, celery, and carrot. Sauté until soft, 8 to 10 minutes. Add the beef, pork, and pancetta; sauté, breaking up with the back of a spoon, until browned, about 15 minutes. Add 2 ½ cups of the stock and the tomato paste; stir to blend. Reduce the heat to very low and gently simmer, stirring occasionally, about 2 hours. Season with salt and pepper. Bring the milk to a simmer in a small saucepan; gradually add to the sauce. Cover the sauce with a lid slightly ajar and simmer over low heat, stirring occasionally, until the milk is absorbed, about 1 hour, adding more stock by ¼ cupfuls to thin if needed. To finish, bring a large pot of seasoned water to a boil (see page 18). Transfer the ragu to a 12-inch sauté pan and bring to a simmer. Add the butter and begin swirling to combine. Once the pasta is cooked 80 percent through, until almost al dente, about 2 to 3 minutes, add it to the pan. Reserve the pasta water. Continue to simmer, stirring constantly, until you achieve a sauce-like consistency, about 3 minutes. Season with salt. Remove from the heat. To serve, divide the pasta and sauce between four plates. Finish with Parmigiano-Reggiano.